Washington, DC - An annual tradition continues as the DC Walk for the Animals takes place on Sunday, September 18th at the Capitol Riverfront. 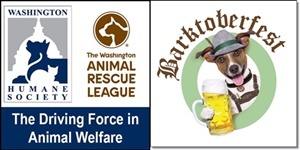 The event includes a one mile walk around the Capitol Riverfront area, admission to Pet-a-palooza and, for the first time, admission to “Barktoberfest” – all to raise money to benefit the 60,000 animals cared for by the Washington Humane Society-Washington Animal Rescue League. EVENT: This event includes admission to Pet-A-Palooza and Barktoberfest all for one ticket price! The entry fee is $35 for walkers, $20 for those under 21, and includes a t-shirt and gift bag and admission to Pet-a-palooza and Barktoberfest. Walkers are encouraged reach out to friends and family to raise at least $125 to help the animals cared for by WHS-WARL (this is a suggested goal; there is not a fundraising requirement for the event). This year’s DC Walk for the Animals has something for everyone! Come out and participate in the walk, enjoy vendor booths, contests for your dogs, win prizes, music, pet adoptions, kids’ entertainment, and much, much more at Pet-a-Palooza! And, you don't want to miss the delicious food trucks and unlimited beer tastings (for those 21+) at Barktoberfest. Visit our webpage to register to walk or purchase tickets and for more event information! The DC Walk for the Animals is a one mile walk around the Capitol Riverfront area to raise money to benefit WHS-WARL and the 60,000 animals we serve each year. Registered walkers will also have access to Pet-A-Palooza and be able to participate in Barktoberfest. Entry fee is $35 for walkers, $20 for those under 21, and includes a t-shirt and gift bag. Barktoberfest gives beer lovers a chance to bring their four legged friends out for an afternoon, sample craft beers and food trucks. Beer enthusiasts will enjoy sampling a wide variety of unique craft brewed beer and grabbing a bite to eat from local food vendors. Quench your thirst at Barktoberfest! For those that do not participate in the Walk for the Animals, tickets are $35 and include a tasting glass (for those 21+). Tickets for designated drivers and those under 21 are $20. Participants in both the DC Walk for the Animals and Barktoberfest will have access to Pet-A-Palooza, which includes vendor booths, pet entertainment, contests, pet adoptions, games, kid’s entertainment, live music provided by 94.7 Fresh FM, and much more! The location for this one-of-a-kind event is the SE Capitol Riverfront at the corner of M St SE & First St SE in D.C. (across from the Navy Yard Metro Station and adjacent to Nats Park). Get your tickets today at www.dclovesdcanimals.org. The Washington Humane Society-Washington Animal Rescue League combined organization cares for more than 60,000 animals annually. The broad range of programs offered include: rescue and adoption, humane law enforcement, low-cost veterinary services, animal care & control, behavior and training, spay-neuter services, humane education, and many others. Operating four animal-care facilities in Washington, D.C., the organization occupies a significant footprint in the District, and serves as a resource to current pet guardians and prospective adopters across the region.